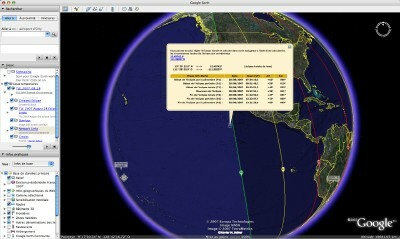 The Google Earth (available for MacOS X, Windows and Linux) files, will draw the solar and lunar eclipses maps and display their local circumstances. 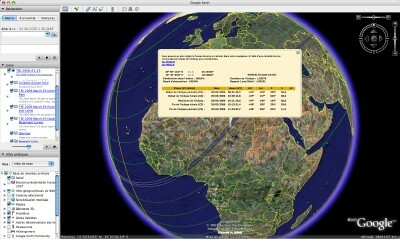 For solar eclipses the paths and outline curves across Earth’s surface will be drawn. And for lunar eclipses only the limit curves showing the visibility area are included. Each file containing all the eclipses over a 20-year span was made using my Five Millennium Canon of Solar Eclipses and Five Millennium Canon of Lunar Eclipses databases. These two web-enabled tools will give you access to the 11,898 solar eclipses and 12,064 lunar eclipses over the -1999 to +3000 period. For total, annular and hybrid solar eclipses, the northern and southern umbra limits are plotted in pink while the central line is blue. The northern and southern penumbra limits, when they exist, are drawn in green; the maximum on horizon curve is also in green and the sunrise/sunset curve is in orange. For total, partial and penumbral lunar eclipses, the penumbra and umbra limits are plotted in green, yellow and red. By clicking on the framed cross-hair cursor , always located at the center of the view, you will obtain the local circumstances at that location (have a look at this sample). "Solar Eclipses" | "Lunar Eclipses"
of the March 2006 total solar eclipse. Initial view once you have done a "File -> Open". circumstances bubble of the August 2007 total lunar eclipse. Last page update on May 31, 2007.